As its mission, Phindie provides independent coverage of Philadelphia theater and arts, with a focus on independent theater. So FringeArts Philadelphia Fringe Festival is a perfectly aligned two-week event. With previews of multiple shows, picks from leading Fringers, interviews with the artists behind some of the most anticipated shows, and seasoned reviewers attending over 100 performances, Phindie is providing more Festival coverage than any other publication, and BETTER! But what should I see? Well, you could join PHINDIE’S OFFICIAL FRINGE BIKE TOUR. Or here are some Fringe Picks! Theater writer Deb Miller’s 15 Picks from the Neighborhood Fringe. Plays & Players’ artistic director Dan Student’s Fringe picks. 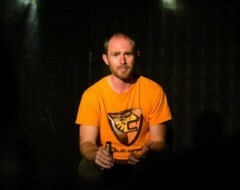 IRC’s RHINOCEROS: Foley’s Fringe Binge 2014: 20 Shows in 20 days. Who’s On First? Last year, Phindie reviewed 78 shows, more than any publication in the world (ahem). Check all the 2014 Fringe Festival reviews to see how we get on this year.